Alberta Premier Alison Redford and Mayor Stephen Mandel broke ground with Wellspring Edmonton board members and supporters in a ceremony on August 29, 2013. 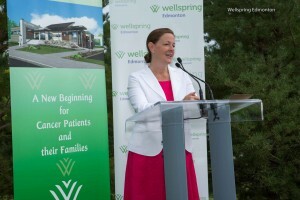 The event kick-started the capital campaign to build the Wellspring centre for Edmonton and area cancer patients, their families and caregivers. Hundreds of supporters gathered to witness the unveiling of the official site sign that marks construction of the 12,000 sq. ft. facility on a parcel of land located on the corner of 65 Avenue and 113 Street. The land is leased from the Government of Alberta for $1 per year over a 25-year period. The campaign has $4 million pledged to date, or 60 per cent of its $7-million goal. The organization is now calling on the community to help raise the remaining $3 million needed for the centre to open in 2014.